Built with commercial-grade components, ProLine® electric models are made for durability and designed to help lower your monthly evergy bills. 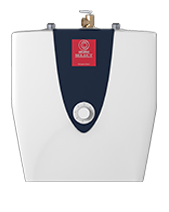 The ProLine family offers a wide range of water heating solutions—from models that help you qualify for electric utility rebates to high recovery models ideal for large families with high demand for hot water. 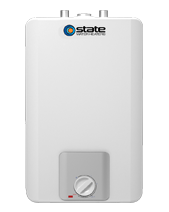 The State ProLine line of electric water heaters offers a broad range of quality water heaters to meet your needs. The ProLine specialty electric models include the Table Top, Compact and Point-of-Use models. 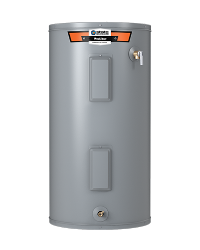 For quality and dependability and a wide range of choices, there’s a ProLine that’s right for every home! Features a convenient flat porcelain surface at 36” height, providing extra “counter space” wherever installed. 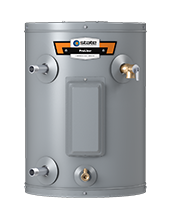 All plumbing and electrical connections are made through the back of the water heater. 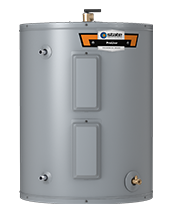 This heater is equipped with a PEX cross-linked polymer dip tube. Side-mounted plumbing and electrical connections (optional top-mounted water connections for field conversion). 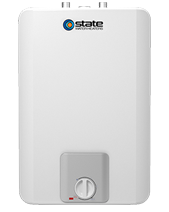 Designed for installation under a counter, in a crawl space or in other tight spaces. 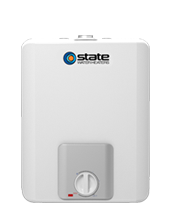 Designed for low-demand, such as office lavatories or buildings with remote restrooms.